Palin wrote most of his comedic material with fellow Python member Terry Jones. Before Monty Python, they had worked on other shows such as the Ken Dodd Show, The Frost Report, and Do Not Adjust Your Set. Palin appeared in some of the most famous Python sketches, including "Argument Clinic", "Dead Parrot sketch", "The Lumberjack Song", "The Spanish Inquisition", and "The Fish-Slapping Dance". Palin was born in Broomhill, Sheffield, the second child and only son of Edward Moreton Palin (b. 1900, d. 1977). and Mary Rachel Lockhart (née Ovey; b. 1903, d. 1990). His father was a Shrewsbury School and Cambridge-educated engineer working for a steel firm. His maternal grandfather, Lieutenant-Colonel Richard Lockhart Ovey, DSO, was High Sheriff of Oxfordshire in 1927. He started his education at Birkdale Preparatory School, Sheffield, and later Shrewsbury School. His sister Angela was nine years older than he was. Despite the age gap the two had a close relationship until her suicide in 1987. He has ancestral roots in Letterkenny, County Donegal. Inside the Globe there are commemorative stones to mark donors to the theatre. Palin has his own stone but it is misspelt as "Michael Pallin". The story goes that John Cleese paid for the stone, and mischievously insisted on misspelling his name. 1 2 "Film Nominations 1988". BAFTA. Retrieved 11 January 2008. ↑ "Trio of Dames lead showbiz honours". BBC News. 31 December 1999. Retrieved 15 August 2006. ↑ "Michael Palin To Receive Academy Fellowship at the Arqiva British Academy Television Awards". ↑ Nick Barratt (11 November 2006). "Family detective". The Daily Telegraph. UK. Retrieved 25 October 2008. 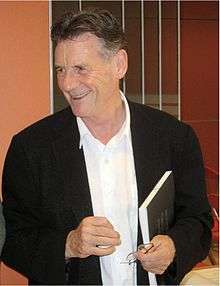 ↑ "Michael Palin Biography (1943–)". Filmreference.com. Retrieved 1 June 2011. 1 2 3 4 5 Chalmers, Robert (29 July 2012). "The dark knight rises: Perhaps Michael Palin isn't the nicest chap in Britain after all...". The Independent. Retrieved 14 August 2012. ↑ "The wandering man". Thestandard.com.hk. Archived from the original on 22 May 2011. Retrieved 1 June 2011. ↑ Feeny, Seán P. (14 March 2013). "First Letterkenny heritage magazine launched". Donegal News. Retrieved 14 March 2013. Over 100 people attended the official launch of Letterkenny Community Heritage Group's new magazine in the Station House Hotel this week. 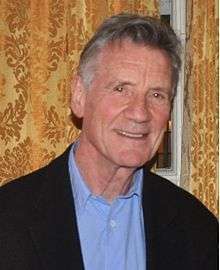 [...] Did you know that Michael Palin of Monty Python fame has ancestral roots in the town? 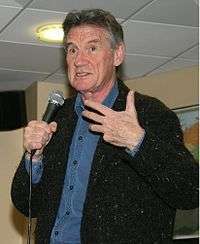 ↑ Michael Palin biography Archived 1 February 2009 at the Wayback Machine. ↑ "ABC TV Documentaries: Sahara episode 3/4". Australian Broadcasting Company. Retrieved 2 September 2006. ↑ Warman, Anna. "Travelling with Michael Palin". Retrieved 14 August 2006. ↑ "Home truths on Wanderlust". Camden New Yournal. 27 September 2007. Retrieved 7 September 2008. ↑ Oliver, John. "Michael Palin". BFI Screen Online. Retrieved 13 December 2006. ↑ Hodgkinson, Tom (2006). "In Conversation with Michael Palin". The Idler. Retrieved 20 December 2006. ↑ "Biography". Pythonet.org. Retrieved 17 December 2006. ↑ "A Series of Bird's". BBC Guide to Comedy. Retrieved 16 September 2006. ↑ "NEWS 1999_01_17 – Michael Palin Dropped From Final Print of Hanks/Ryan Romantic Comedy". Daily Llama. Retrieved 1 June 2011. ↑ Campaign for Better Transport website Archived 17 October 2008 at the Wayback Machine. ↑ "American Friends". Rotten Tomatoes.com. Retrieved 13 December 2006. ↑ "Python Palin stars in BBC WWI drama". BBC News. Retrieved 2 July 2013. ↑ Vestey, Michael (6 August 2005). "Watching over Whicker". Findarticles.com. Retrieved 25 October 2008. ↑ Webster, Ben (14 January 2005). "Globetrotter Palin brought down to earth by eco-lobby". The Times. London. Retrieved 14 August 2006. ↑ Wilkinson, Carl (8 January 2006). "My favourite place in the world". The Observer. UK. Retrieved 18 August 2007. ↑ "Timewatch – The Last Day of World War One". BBC. Retrieved 1 November 2008. ↑ "Michael Palin: 'BBC still lets us experiment'". BBC News. 16 July 2015. Retrieved 17 July 2015. ↑ "JPL Small-Body Database Browser". Jet Propulsion Laboratory. Retrieved 17 October 2006. ↑ "Virgin Trains". Retrieved 13 December 2006. ↑ "Palin's centre for stammerers wins £340,000 grant". Retrieved 9 September 2008. 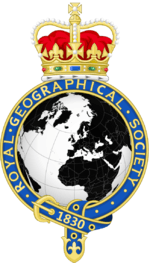 ↑ "Royal Scottish Geographical Society: Medals & Awards". Retrieved 29 January 2010. ↑ Ouzounian, Richard (26 June 2013). "Michael Palin, from Monty Python to travel series host". The Toronto Star. Retrieved 26 June 2013. ↑ "Michael Palin announced as new president of Royal Geographical Society (with IBG)" (PDF). Retrieved 25 November 2009. ↑ "Moorlands School Forms and Houses". Retrieved 24 April 2015. ↑ Lee, Marc (24 August 2009). "Michael Palin: he's not a Messiah, just a very nice man". The Daily Telegraph. London. ↑ "11 Secret Features Of Famous London Landmarks". Londonist. 20 October 2015. ↑ "Michael Palin to narrate The Clangers series". ↑ "BAFTA Film Awards – Best Supporting Actor 1989". BAFTA. ↑ "Monty Python Special Award". Archived from the original on 8 November 2009. Retrieved 20 October 2009. ↑ "TV Baftas 2013: all the winners". The Guardian. 12 May 2013. ↑ "Michael Palin To Receive Academy Fellowship at the Arqiva British Academy Television Awards". BAFTA.